My brother Tripp and I grew up in a house with jazz as the main event on the family turntable. Miles, Bennie Carter, and Stan Getz filled the air and our father Hall was playing the bongos along with these classic jazz sides. Tripp and I first played rock and roll, which is a pretty standard path for young pranksters. In high school we morphed our direction into jazz and it came to us naturally. It was in our blood, thanks to our Pop. Over the years, our father has been part of our various bands and in Blurring The Edges he is an integral component of the group. 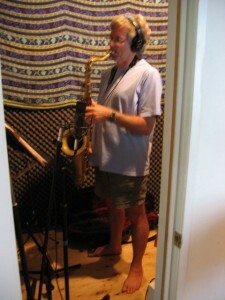 He’s recorded on the group’s 2 CD’s and has played on all of the gigs. Tripp and I got to thinking how he’s never had the opportunity to be the main cat on any of these projects so we set out to create a CD where he is the band leader, the composer, the whistler, and the visionary of the group. The first step was for him to select some of his favorite tunes to record. His roots lie in the Great American Songbook and his choice of songs are absolute gems. I suggested he compose some tunes for the project and he came up with 3 cool pieces that make remarkable sense, especially coming from someone with no formal composing training. He’s a natural! 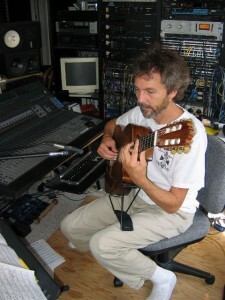 His tunes have sweet melodies and are fun to improvise on too. Step two was gathering the band. 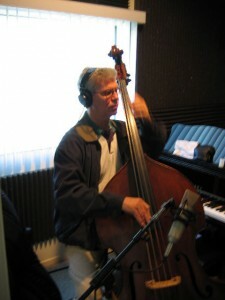 Of course Tripp, Dad, and myself were in, and for bass you couldn’t get a better player than Bob Magnusson. He’s been our favorite for years and is like a family member to us. Dad was thrilled to the hilt to play with Bob and his trademark swing. We recorded for a couple of days and came up with some great music. 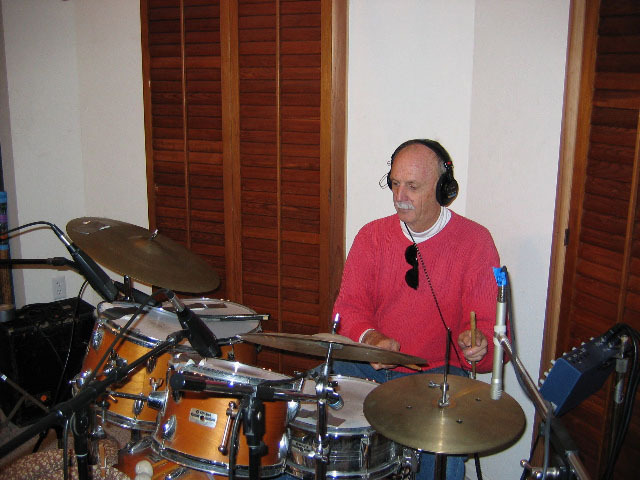 Dad’s got a good groove on the drums, plays a sweet supportive role, and also, dig his whistling improvisation on “Just You, Just Me”— the cat has good ears! So we’re leaning into 2005 and feeling good about the state of jazz in the Sprague Family sphere. Look below for my Dad’s notes on the project and I found them to be beautifully written and telling a wonderful story. Years ago I happened upon a TV documentary about a New England family -mom, dad, and two grown daughters. They gathered each Christmas to play (day and night) as many Bach string quartets as they could fit into a ten-day reunion. One daughter was a violinist; the other played cello. Mom was second violinist and dad handled viola parts. As I watched I thought to myself, “That must be the most wonderful experience any parent could ever hope to have.” And here I am, a certified geezer, still crazy after all these years, having the privilege to play jazz with my two sons. Talk about dreams come true. In the early 70s, when Peter and Tripp were around 15, they set a life-course for themselves whose curriculum was simple in the extreme: jazz and surfing. A kind of renaissance was occurring in Del Mar, their home at the time. Seemingly out of nowhere youngsters were, without provocation, devoting serious hours to learning guitar, flute, saxophone, trumpet, etc., pouring themselves into mastering the subtleties of vocalizing, painting (oils, not walls) dancing, sculpting, etc. This was not just an adolescent fad. Today, many of them are full time professionals, working in perhaps the hardest-of-all fields: the arts. Tripp and Peter were eminent figures in that illustrious group. Needless to say, their life-course broadened as time went on, to include marriage, parenting, travel, movie-making, engineering recordings, and much more. I would proudly add that during this extraordinary time, my daughter Terry, the boys’ older sister, began a career in dance and choreography that continues to this day. I am in awe of my boys. My recollection is that at age 15 I could just barely tie my own shoes. I had something to do with their becoming professional jazz musicians, but it was profoundly indirect. I was of the school of parenting known as Benign Neglect. I don’t recall ever asking or directing them to do anything musical. To be sure, I was intensely enthusiastic about jazz. My instrument at the time was the phonograph. At home I played LPs by Miles, Dizzy, Getz, Brubeck, etc. almost non-stop. The jazz magic apparently wormed its way into their spirits. Nevertheless, their first garage band was of the rock and roll genre. After a few months, though, to my surprise and delight, they switched to jazz. 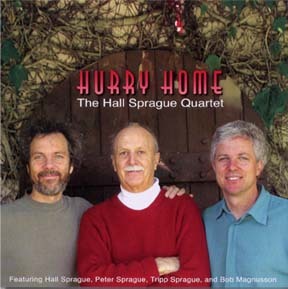 The Sprague Squad is joined on this album by Bob Magnusson, world-class bassist and beloved friend. Again, for me, it is beyond my wildest imagination to be playing with Bob, whom I have admired hugely since the 60s when the boys and I would venture to the Catamaran Hotel in Pacific Beach to hear him anchoring the best jazz band in town. And once, when Sarah Vaughan was on that very same stage, and we were all in the audience, she interrupted a song when she saw Bob at a table with his wife Janet, and then howled “Bobby!” and stepped down to give him the warmest imaginable hug. He had been her bassist for two years in earlier times. I wrote three songs for this CD, the only ones I have ever attempted. This from someone who can’t even read music. The magic of an electronic keyboard, a marvelous Mac computer, a killer software program, and key tweaks from Peter made it possible. The ballad is titled “Marguerite,” my late mother’s name. She nurtured me through my childhood, then died way too soon. I never got to know her as an adult, never got to tell her how much she meant to me. Perhaps this modest tribute will help, in some cosmic way, to make amends. It means to be beautiful. Like she was. “Recuerdos,” (remembrances, memories) a bossa nova tune, simply acknowledges that when you are as old as I am, and when you’ve been fortunate enough to have as many new experiences as have come my way, your mind is flooded frequently, whether you want it to be or not, with recollections of events in the past, some of them embarrassing and saddening, but more that soothe your soul and make you know how lucky you have been. I have no idea how I came up with the title “Hurry Home” for the upbeat tune, and it probably doesn’t matter. But there is this: I am a homebody, through and through, and when my life takes an undesirable lurch, my instinct is to quickly get myself into the comforting arms of my wife, Carmen, and the space we share. The other songs are mostly standards that have been favorites of mine for decades. What fun it is to give them a wee twist here and a slight bend there, to make them our very own. I hope you enjoy the music as much as we enjoyed making it. Next to love, music is, after all, the most important thing in the world. And jazz is right up there, at the top, with all the other forms, many of them more celebrated, more popular, more “serious,” but none more expressive of our passions and hopes. 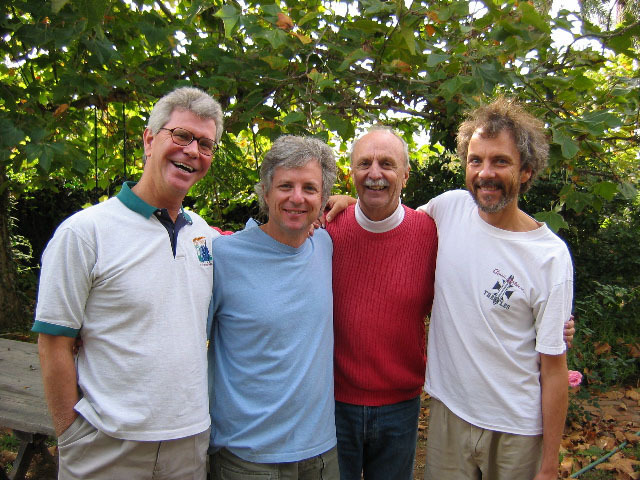 The Hurry Home band with (left to right) Bob Magnusson, Tripp, Hall, and Peter.